If you need a modern and continuous power supply in your home, then we have just the deal for you. Available immediately, this iClever BoostStrip offers 3 AC outlets and an array of USB ports all for a one-off single purchase price of just $16.99. With products such as this, the design is extremely important. This isn’t going to be a power supply which is hidden away to power a single appliance or product. This is likely going to be placed within a room and be immediately visible so it’s imperative that at least some thought has been placed into the physical product design. And it’s very evident that it has been in this instance. It’s sleek and as well designed as it could be given the type of hardware that it actually is. In terms of what it offers and how it extends the current power offering in a property, the BoostStrip comes with a total of three individual AC outlets for plugging in appliances. That includes lamps, small appliances, television sets, computers, and pretty much anything else that you currently have within your property. If you were feeling extra adventurous, then you could even plug a smart plug into this BoostStrip for protected intelligent power. In addition, it also adds extra versatility by adding in for individual USB ports that are perfectly placed to allow you to charge devices like smartphones and tablets by USB or even plug in smart home hubs that come with a USB cable. iClever has also ensured that connected devices are protected thanks to the multi-protection safety system that is built into the hardware. It offers protection against short-circuits, low-voltage, surge issues, and heat resistance up to 750-degrees Celsius. 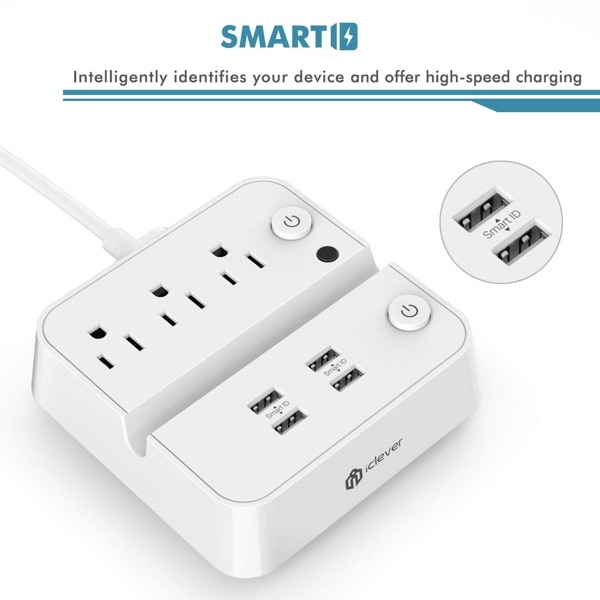 That is all in addition to the powerful SmartID charging technology that is capable of detecting the connected devices and providing the optimal charging speed and performance. All of that power and functionality makes it entirely worth the purchase. But wait, there is more! It even has a nifty crevis in the middle of the hardware which makes a perfect resting space for your smartphone whilst it is charging. Form and functionality all baked into one product. Who remembers when this site used to offer interesting stories about latest tech? Now it seems to just be a site showing prices for discounted tech instead. Pity, it used to be a goto site for latest info a few years back. Yea i need to find a replacement. And all these post are just to generate money from affiliate linking.